I am drawn to figure drawing, probably from the same place in my heart and soul as I was drawn to the human body and a career as a physician. 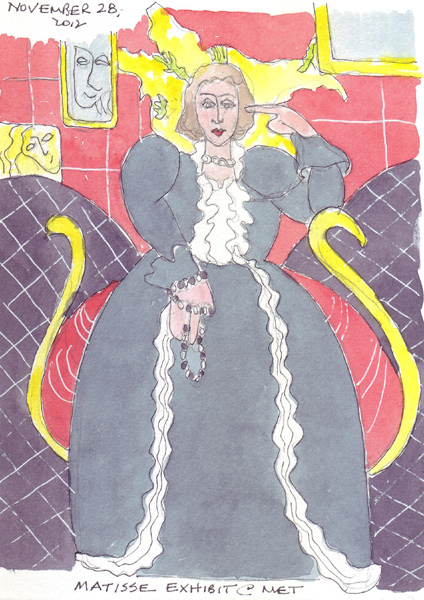 I love to draw figures and gravitate to them when I want to copy a Master drawing or painting in a museum exhibit. Yesterday I sketched 5 Picasso works at the Guggenheim exhibit called Picasso: Black and White. I'm still learning! And I really practice!! I not only keep large sketchbooks for live figure drawing sessions, I also keep small sketchbooks for sketching body parts: portraits, hands, feet, and even the crazy figures on posemaniacs.com. 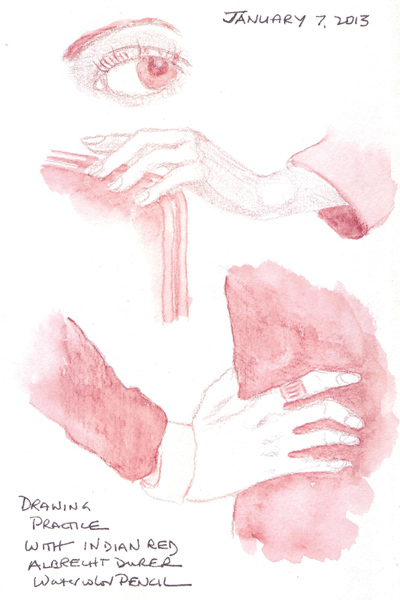 I sketched every hand sign from the American Sign Languare website over the last few years, but I still struggle drawing hands on the live models. So I keep practicing. These are drawings that I did from photos that I collect just for practice sessions. On this page I was also trying out an Indian Red Albrecht Durer watercolor pencil because I love the red chalk used by the Masters in their drawings and I hate drawing with conte pencils or crayons. 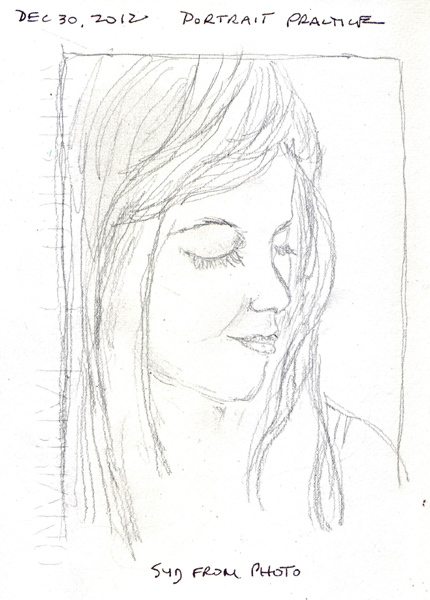 This is a recent drawing I did of my oldest grand daughter from a photo that I took. She is only 8 and I continually make her look like a teenager in my drawings - and can't figure out how to retain the look of a child. 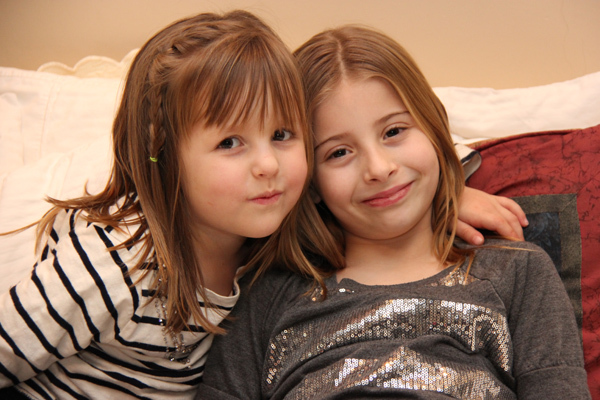 My Girls: We only have two grand daughters - Annabelle age 4 and Sydney age 8. The other 6 are boys! 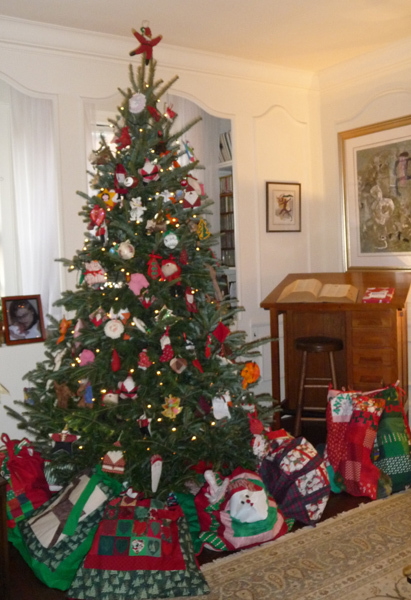 We took lots of photos at Christmas, so I have many more photos I can draw for practice. But I'm certainly not there yet! 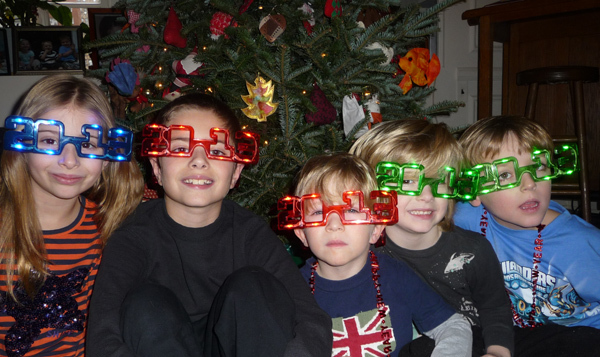 We had our annual New Year's Eve Party and Overnight for our 5 New York grandchildren. The 6th one here in the City is 3 months old and spent the night with his other Grandmother. We've now had the party enough times that we actually have some rituals - and taking a picture in the new glasses is one of them. This year the 2013 design had blinking lights which you can see here. I'm still managing to sketch in spite of busy days and too many other projects. But I'm frustrated that I can't capture better images of my family. 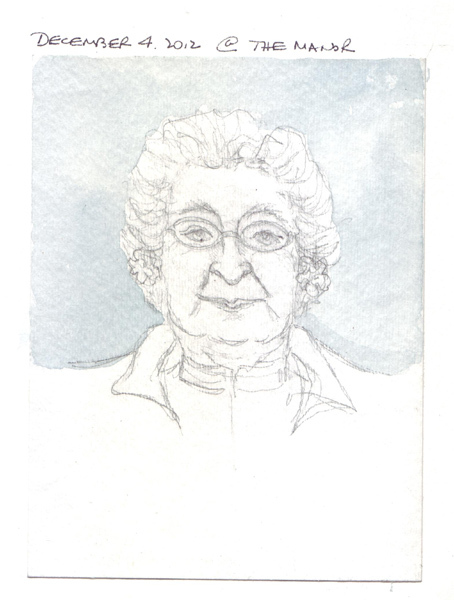 I've sketched my Mother when sitting with her many times over the past few years. Most of the sketches look alike, just not like her. Here are the ones I made in the last month. This one was made during a recent brief hospitalization. 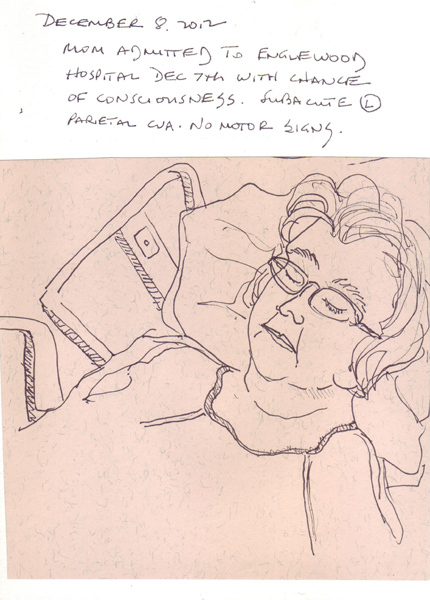 She is 93 and had several very small strokes in the last 4 months - mainly affecting her memory. I definitely need to go back to my Live Figure Drawing sessions this week! There are some wonderful art exhibits in New York City for the next several months - especially if you love to draw from the Masters as I do. I linked to the exhibit pages - and you can see many, if not most of the works in these exhibits! Teri, Pat, Benedicte and I went to the opening preview of the new Matisse exhibit at the Metropolitan Museum of Art. This is a very educational exhibit, demonstrating how Matisse returned to the same images, in order to work on techniques and to push the images as far as he could. He had a photographer documenting the various stages of some of his paintings and many large prints of the photographs are hung with the paintings in the exhibit. The website has many images in the selected highlights section. It is really worth studying. I sketched and later painted The Large Blue Dress from 1937. There is a new Abstract Expressionist exhibit at the Museum of Modern Art. It is hard to sketch from these paintings, but I carefully studied 2 of Marsden Hartley's paintings that I liked. I made a list of the shared iconic symbols in the two paintings and used them in my own drawing at home. I still haven't painted it, so instead I want to show you a sketch I did of a sculpture I loved that afternoon. Alina Szapocznikow was trained as a classic sculptor and now focuses on the human figure in her work. I never heard of her before, but fell in love with her work in this new exhibit of her sculptures and drawings. This was my favorite life-size sculpture. The last exhibit I saw was Mategna to Matisse at the Frick. There are 58 Master Drawings from the Courtauld Gallery in London. I loved this exhibit! 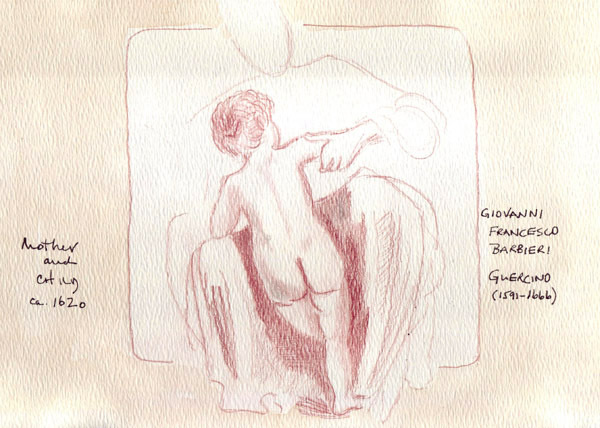 The first drawing of the exhibit was Guercino's Mother and Child. 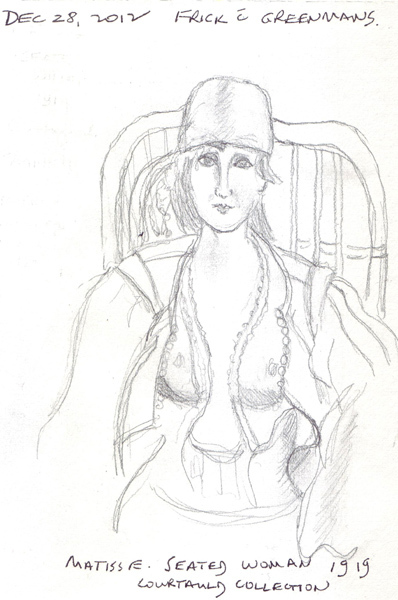 I first saw this drawing at the Courtauld in June 2007 and sketched it then. And it felt like I was seeing a wonderful old friend! Here is my drawing from 2007. 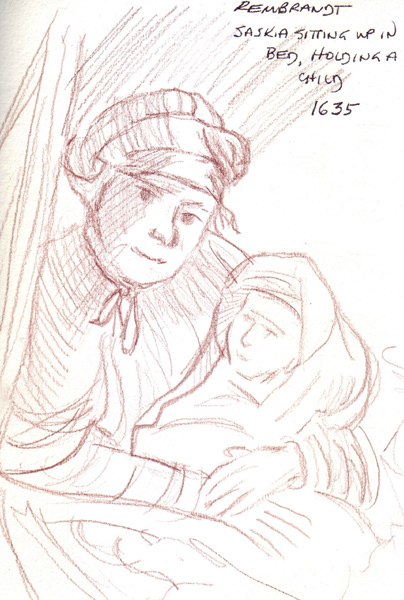 This time I sketched a Rembrandt and a Matisse. The Frick website has many images, divided by country of origin. And the thumbnails can be enlarged enough to see most of the images. Long Term Goals: Develop better drawing and painting skills on paper and with dye-painting and surface design on fabric. I am retired and developing skills in art gives meaning to my days - to play, have fun, be bold, and seek adventure! 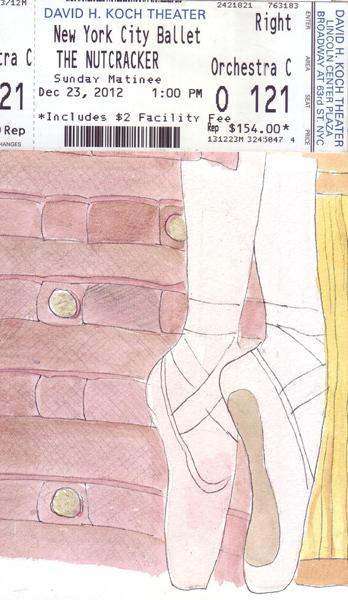 My Short Term Art Goals for 2012 were to sketch and paint everyday and to blog twice each week. Although I missed an occasional daily sketch, I frequently filled several sketchbook pages in one day. I kept one doodle book and multiple sketchbooks, including a chronologic visual journal, and individual sketchbooks for figure drawing and travel. This year my biggest accomplishments were my travel sketchbooks - one created in Venice and the other during a 2 week trip to Berlin, Dresden, Prague, and Budapest. I was drawing "in the moment" and capturing the essence of our days. Before we went to Venice, I painted 16 of my 2002 photos from Venice for practice. It gave me the confidence that I needed and the practice of creating some of the texture of the buildings in watercolor. I used two 30 inch, accordion folded sheets of watercolor paper for this practice. Each strip could then be made into 2 folios for another cased-in, travel sketchbook when we returned. And with a rare exception, I continued my twice weekly blog posts and on January 4th will reach the 7th anniversary of my blog. 1. I continued to explore watercolor as my main medium and loved Kate Johnson’s online Strathmore Workshop. I hope that she will develop her online watercolor mini-class or offer her regular watercolor class in 2013. 2. I bought 3 tubes of gouache in primary colors and did lots of color mixing and painting to learn how to add this medium to my paintings. 3. I tried acrylic paints with my friend Teri, learning about many of the possible additives and special techniques (i.e. molding paste, crackle etc). I probably won’t ever LOVE acrylic paints, but it is nice to explore them and play on a regular basis. 4. I sketched at least one Master work from each museum or gallery exhibit I attended to challenge myself, and just maybe improve my drawing and painting skills. 5. I took several other online classes: Self-Portraits with Jane Davies, Ticket to Venice with Mary Ann Moss, and Stencil Magic with Melanie Testa. 6. I made my own watercolor sketchbooks for daily use and recycled old books with watercolor paper for travel. As I was making the one for our Venice trip, I documented the process and posted it to my blog as a tutorial. 7. I really enjoy bookbinding and I’m thrilled with the Christmas Origami Tag artist book and second Remains of the Day book that I made and filled. 8. I met with The Central Park Drawing and Art Meetup Group and my friends Benedicte, Pat, and Teri for art adventures. And I went to the Society of Illustrators and the Battery Park City figure drawing sessions. More bookbinding - perhaps exploring a new structure every month to give me some very specific goals. This is the year when our DC children/grandchildren join us for Christmas weekend. On Sunday I took Annabelle and Sydney to the New York City Ballet Nutcracker. It was 4 year old Annabelle's first time and Sydney's 4th! Sunday evening my husband and I made dinner for all 16 of us and we continued our family tradition by giving our presents to the children on Christmas Eve. Here are the 7 children's gift bags and 8 stockings packed and ready. And our 8 grandchildren as they headed off to watch a movie. Yesterday our daughter made Christmas dinner at her apartment and we again were 8 adults and 8 children. Zachary, Annabelle, Sydney and I spent time painting Santas in the afternoon. 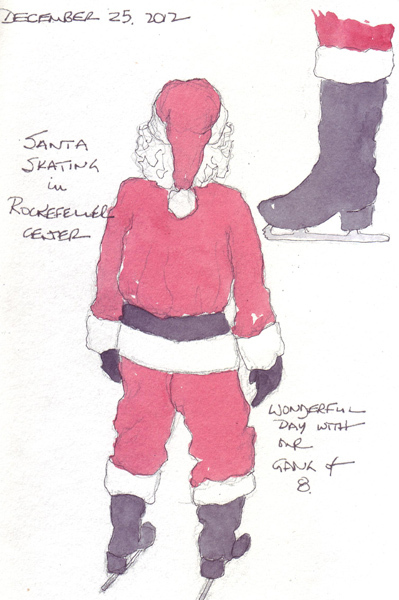 My Santa was drawn from a photo that Sydney and I took last week at Rockefeller Center - of the skating Santa. Hope everyone is having a happy holiday.